‘MyGoodbye’ turns off the lights when you leave. Both can be edited by yourself. With MyLights now you can arrive home safely, and get out the door faster. Want to future proof your home and add extra value? Whether it’s convenience and comfort you crave or security and savings you seek, Advantage Air’s MyLights LED lighting system has you covered. Once you’ve found the perfect light settings to keep the kids’ nightmares at bay, set the mood for a dinner party or watch a movie, you can save the configuration on the Scenes page. Your lighting will automatically return to that level when you run that Scene. When you use a light more often than others, it will automatically show this light on your Home page. Is MyLights suitable for my home? MyLights can easily be incorporated into any new home build.However, if you’re building a 2-storey home, it must be installed before the upstairs slab is laid. 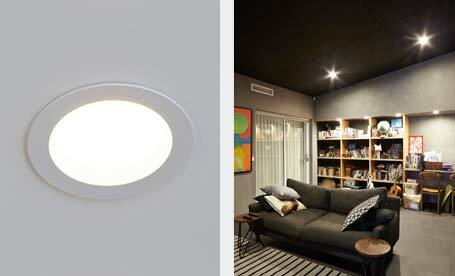 MyLights can be installed into existing homes. Simply speak to a MyLights Specialist to find out if you can swap to a MyLights smart lighting system. When you talk with your builder or MyLights Specialist, going in with a plan of what you want means you both have a good understanding when it comes to mapping out a diagram of your future smart home. So what are you waiting for? 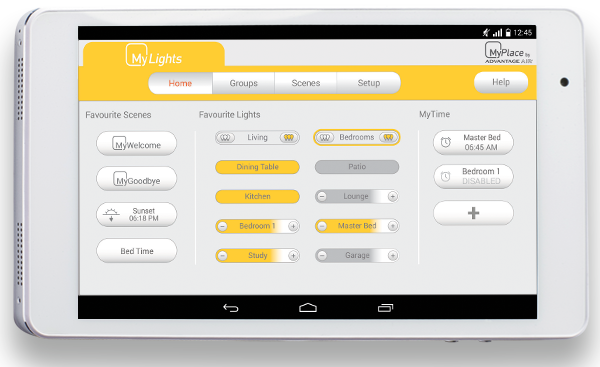 Start a conversation with your MyLights Specialist or home builder today and move into the new age of the smart home! Our daily routines mean we return to the same light settings on a regular basis. We want the front lights on at 6pm Monday to Friday; we want the bathroom lights on at 6am on the mornings we go the gym. With MyLights scheduling, each of your saved scenes is eligible to be run up to once per day, so simply choose a time you would like that scene to run, and then select the days on which you want that to occur. Leave the schedule running while you’re on holiday and it will look like you are home, going about life as usual. Wouldn’t you prefer to wake up to light gently filling your room than a screeching alarm clock? With the MyTime function, you select when you’d like to wake up. At your chosen time your bedroom lights slowly start to fade up, until your room is brightly lit. It’s like waking to the sunrise, even though your curtains are drawn. Being completely silent, MyTime lets you wake without disturbing the rest of the house. When the sun goes down, the Sunset function automatically turns the lights on so you’re never left in the dark. Just think – no abandoning barbie duties to go inside and turn the lights on, or waking up from an afternoon nap to a disconcertingly dark house. MyLights monitors the daily sunset time for your area based on your postcode. The Sunset function is fully customisable, so you choose which lights come on and how brightly. Changing the lighting has the power to change the mood. Dim the lights and suddenly dinner becomes cuisine; the bathroom becomes a spa; and everyone looks more attractive. With MyLights you can adjust your indoor and outdoor MyLights by area or individually, and dim them to the setting that suits you. Do you prefer a clean crisp bright light, or a warm moody glow? MyLights energy efficient 10-watt LED’s comes with a choice of warm, natural or cool, so you can always be seen in your best light. The light fittings sit flush with the ceiling and comes with a choice of two contemporary finishes: white or brushed steel. 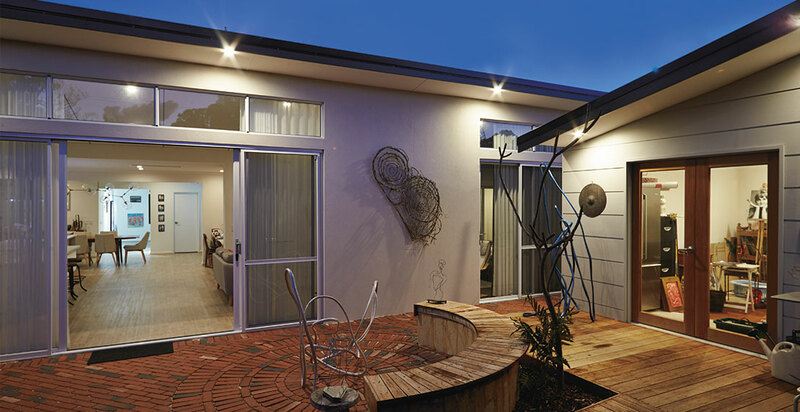 MyLight fittings can be used inside and out, providing the outdoor area is undercover like an alfresco or portico. Want to have a hands-on play of MyLights? Take the next step and contact us.